This whole week I had been writing about my experiences with the Occupy movement, and while I really valued the learning experience I got that weekend, it took an interview with the campus television station for me to really think about why I went and what I learned from the experience. I have no question in my mind that I am part of the 99%. I also have no doubt that there is still a lot of misinformation about the Occupy movement. The 99% may have some lazy people in it, who would rather live on welfare than go out and look for a job, but that is not the movement as a whole. There may be antiestablishment hippies and anarchists as part of the movement, but every movement has some form of anarchist sect as part of the movement. The 99% is really the 99% of Americans that have been continually screwed over by the richest 1%. The 99% don’t have the luxury of having tax loopholes to keep more of their money. We work hard for our money, and while most of us are happy to pay taxes, we hate the idea of our tax money being used to bail out huge corporations, and instead be used for million dollar bonuses. The income gap between the rich and the middle class is growing. It’s far too large already, but it’s continuing to grow. There needs to be something put in place to stop this sort of thing from happening. If it requires a bit of socialism to make sure that everyone is doing and receiving their fair share, then so be it. A little bit of socialism never hurt anyone; just look at Medicare/Medicaid, Social Security, etc. The movement, despite how it’s being portrayed, is not anti-capitalist. If you work hard to earn your money, you should be able to have it. The movement is, however, against corporate greed and corporate influence in the political system. The movement is about making sure that everyone has an equal chance at the three most important things listed in the Constitution: Life, Liberty, and the Pursuit of Happiness. I’m part of the 99%, not because I’m an angry liberal, or a socialist, or lazy, or unemployed, or whiny. I’m part of the 99% because I believe that the American people should help each other out no matter what. I believe in peace and equality, which honestly, sometimes seems like a pipe dream. But I know it’s possible, if we could get over ourselves and over our politics. During the interview, I was asked why, with a campus of 1800 students, only 2 students went to Occupy St. Louis. It was a spur-of-the-moment question, one that came up as we were talking during commercial breaks, but it was an interesting point. I suggested that it was mostly a media thing, as the Occupy movement is often portrayed as a “liberal” movement, and with my part of Iowa being mostly conservative, it seems that some of the more conservative students didn’t want to be associated with anything “liberal”. As I said last night, the movement isn’t the 99% of liberals, or the 99% of libertarians, or the 99% of conservatives. It’s the 99% of Americans. We’re all suffering together, and it’s going to take all of us to bring about any sort of change. If you believe you are part of the 1%, but are not making over a million dollars a year, you are lying to yourself. You’re all part of the same movement, whether you like it or not, and it’s up to all of us to join forces and make a difference. In today’s post, I’ll be taking a brief break from speculating and talking about the movement as a whole, and will use this time to talk about Eric. While it may seem like a filler anecdote, I believe it illustrates not only the spirit of the movement, but also how the Occupy movement self-regulates and strives to maintain a consistent image and message. Eric seemed, at first, to be like any other Occupier. Here was a man, angry at his current situation, looking for a way to express that frustration. However, he didn’t always express it in a peaceful manner. Eric was always the loudest yeller in the group, and always the first to confront someone who hurled insults at us. At first, it was admirable. Soon, it got annoying. After a while, some were perceiving it as detrimental to the group. Each new insult would cause Eric to go into a frenzy, launching obscenities, and at one point, physically confronting the insulter. After the Cardinals won the World Series, there was a huge crowd of people celebrating in the streets. A side effect of this was that traffic was horrible, with many intersections being just as full of cars as it was with people. As a result, the corner we were standing on–7th and Market–required traffic direction from a couple of police officers. After another half-hearted insult from one of the passersby, Eric lost it, and almost attacked the man. This set Eric off. He dropped his sign, and started hurling obscenities at the officer. A couple of Occupiers grabbed him and brought him back into the compound, probably to talk him down and get him out of the heat of the moment. A few minutes later, Eric was back in full force, screaming insults and obscenities at the officer, and flipping him the bird. This went on for nearly an hour. Eric grew more and more angry at the officer as the time went by. Ten minutes in, some of the Occupiers realized that this guy was going to cast a negative image on a movement that is already viewed negatively. Someone went back into the compound, grabbed a spare piece of cardboard, and wrote, “Not With Us,” with an arrow pointing directly at Eric. Eric: not part of the movement, not with us. Eventually, the officers had enough of the abuse, and they tackled him to the ground and arrested him. We initially thought that that would be the end of it, but then the officer who was receiving the brunt of the abuse approached us. That’s fair, we collectively agreed. Everyone in our group looked around at each other. No one was going to act as a witness, because no one saw anything. He wasn’t acting in the best interests of the Occupation, so we completely disowned and ignored him. The officer wasn’t happy, but that was the fact. The Occupy movement has the interests of average Americans at it’s core, and fringe people like Eric were hurting the cause more than they were helping it. In today’s society, it’s all about image, and the Occupy movement wishes to keep as positive an image as it can in order to more effectively get its message across. Some people fault the Occupy movement for not having a clear message. Some people that I talked to this weekend were genuinely frustrated with the Occupiers because they didn’t have talking points they could just spout out. 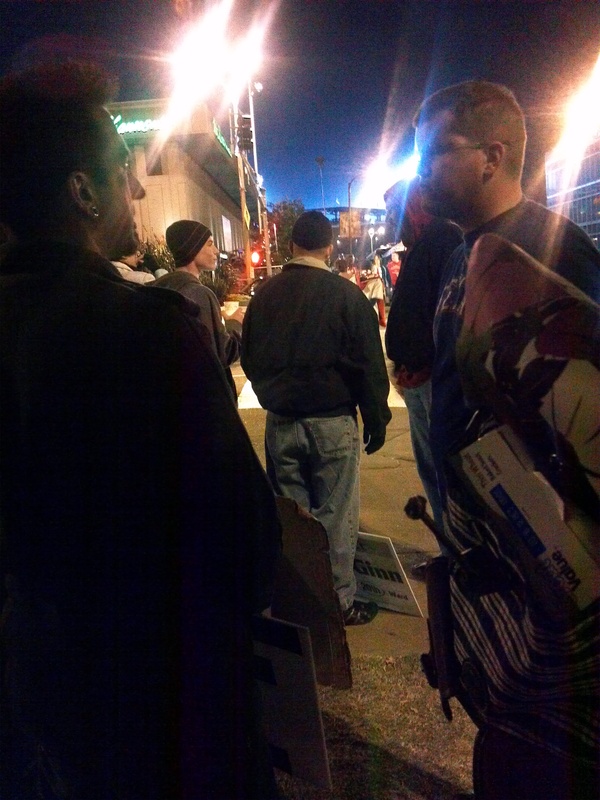 In a conversation I was part of with a lady who stopped us on the sidewalk, I offered my reasons why I was at the Occupy St. Louis protest, which were different from the other two points of view. Granted, it would be a little confusing to hear three different points of view when you view the movement as one huge entity rather than a movement filled with individuals. During a slow period on Saturday, I asked one of my fellow protesters why he thought the movement came about. He told me he felt it was because, as a whole, the Occupy movement was fighting against two major roadblocks in the political discussion: corporate greed and influence, and social apathy. Corporate influence in American politics is probably the largest idea that the Occupy movement is fighting. It’s amazing how simple it is for politicians to be bought out in our political process: if a special interest lobby finds the right politician and throws enough money at them, that politician will vote however the special interest lobby tells them to vote. And no one is immune to it; any person in the political process can be bought out by someone with enough money. A phrase I heard over the weekend, that I’m starting to become a fan of, is “You dance with the one who brought you,” meaning if a politician is elected thanks to unlimited funds from a bunch of major corporations, you better be prepared to be under the rule of that corporation for as long as that politician is in office. Maybe I’m in the minority, but I would rather the politicians I help elect to have the interests of the American public in mind when making decisions, rather than electing Senator Joe Everyman, sponsored by Target. Social apathy is a much broader subject to tackle, but if I understand this man’s thinking, that front is being fought by the movement itself. Corporations have been influencing American politics for quite a while, and there hasn’t been a huge movement to address that fact until the Occupy movement. There may have been some fringe movements in the past, but nothing to the magnitude of the Occupy movement. The social apathy fight, I believe, began in the 2008 election, with the shift to a more grassroots type of campaigning, reaching out to the young voting bloc that is often ignored. More and more young people, many of whom have never been part of the political system before, are now taking a more active role in electing officials and shaping the political spectrum. It’s something that can be admired on both sides of the spectrum: college-aged Republicans, Democrats, and everything in between, working for what they see is best for the American people. The thing is, fighting social apathy doesn’t begin and end with politics. There are injustices all over the world, and in many aspects within the United States, and many times people will ignore these injustices, because caring about them enough to do something about it is a lot of work. The Occupy movement is as much about motivating people to do something about the injustices in our world as it is actually fighting the injustices themselves. If I had to sum up the message of the Occupy movement, the honest answer is that I couldn’t. There are the general principles of fighting greed, getting corporate money out of politics, fighting social apathy, etc. But as for one cohesive message? There isn’t one yet. I’m certain that once more people join in the dialogue, something could possibly be drawn up and a statement released. As one Occupier in St. Louis observed: “This isn’t a movement that will just end once our demands are met.” The Occupy movement is a movement that needs to stick around and continually keep people, corporations, and politicians in check. Because if people are mad now, imagine how they’d feel if the same revolution were to pop up every few years. Part two of Occupy Week. Read Part one, The People, here. If your knowledge of the Occupy movement is based on second-hand reports, you probably assume that the movement is a rag-tag group of individuals, all under common grievances, but essentially just a gathering of people. 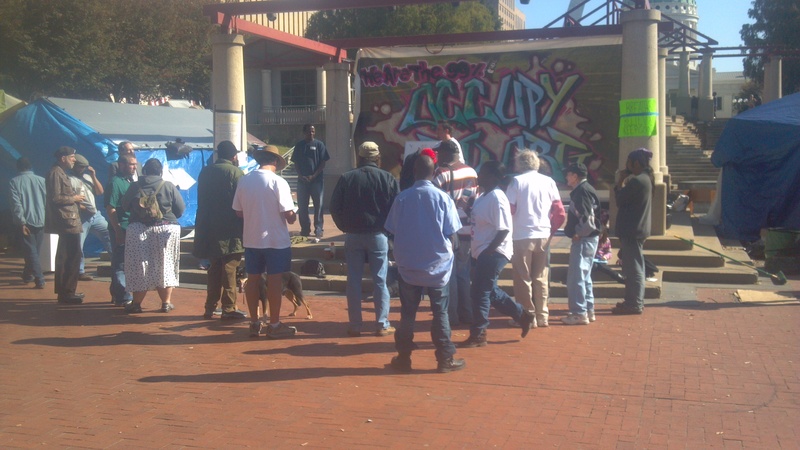 The reality, however, is that the Occupy movements, especially the one in St. Louis, is very organized. Upon entering the camp on the night of October 28, I was informed of four basic rules to the camp: no alcohol, no illegal drugs, no physical violence, and no hateful speech. The rules were simple, really; the Occupy movement is meant to be a peaceful assembly, which is perfectly within the rights of the First Amendment of the Constitution. As soon as things get out of hand, the police would do whatever it took to remove the Occupiers. 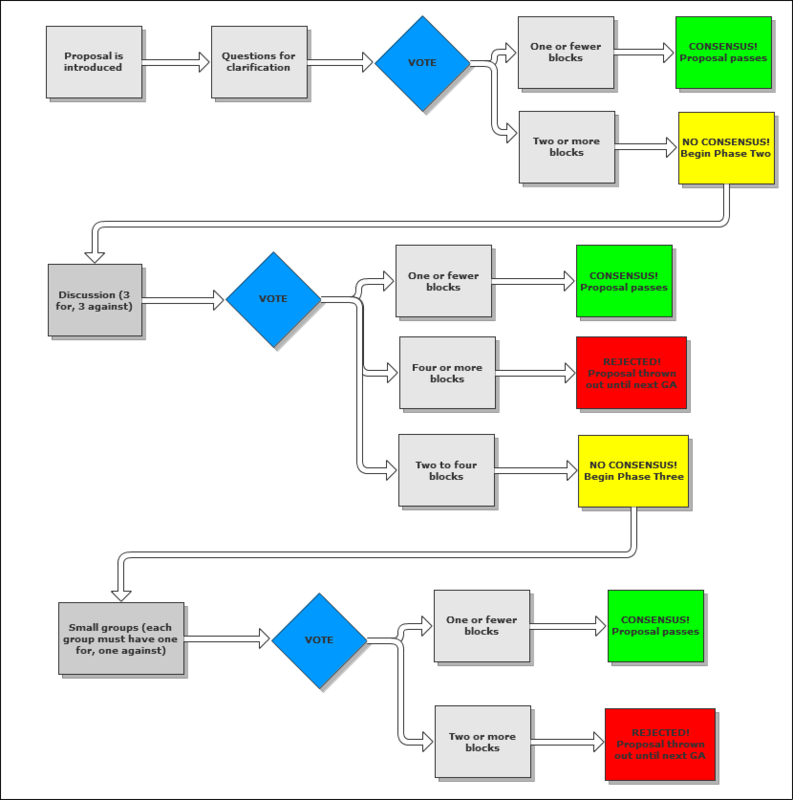 Once the morning of October 29 started, I realized just how organized the movement really is. While there is no system of “government,” per se, there were certainly people in leadership positions, whether they acknowledged they were leaders or not. This, I feel, is one of the major problems of the Occupy movement: there is a desire for there to be no defined leadership, yet, to a fresh set of eyes, there seems to be the beginnings of a defined leader or leaders. If you liked an idea, you did “spirit fingers”. If you couldn’t hear the speaker, you held up an L with your hand, for “louder”. If you felt someone was rambling, you put your fingers in a triangle (get to the point). If you had a clarifying question, you held up a C with your hand. If you had a point of information, or wished to offer a friendly amendment, you held up two fingers. If you felt you heard enough information/discussion and would like to go to a vote, you made circles with your arms, much like the “false start” signal in the NFL. The voting process also had it’s own signals: if you were in favor of a proposal, you held your thumbs up; if you were neutral, thumb sideways; and if you disliked the idea so much that you would leave the occupation, you “blocked” it by holding your arms in an X above your head. What I thought was admirable was that the GAs were not limited to the Occupiers. At one point, Kiener Plaza was nearly full with people from the public, some of whom had brought signs, listening in and voting on proposals. For the most part, the General Assemblies were pretty streamlined and peaceful, with the occasional homeless person not waiting to be on deck to speak, and instead walking right up to the stage and speaking his or her peace. But for the most part, the Occupy movement is extremely organized. 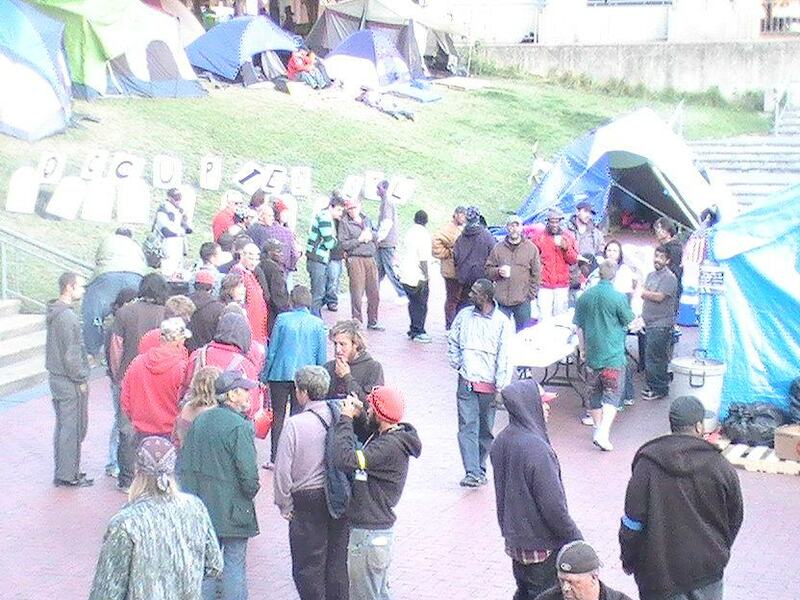 Safety was a huge concern, as Occupiers were camping out in tents on the Plaza, susceptible to any and all disturbances. In my experience, the safety team at St. Louis was very well run, as my only problem in the night was setting up the tent, and finding a comfortable position to sleep in. The verbal abuse during the day didn’t slow down at night. One lady made a huge deal of her disapproval: “Oh, you think you’re making such a HUGE statement by sleeping in a TENT! I’m just gonna go back to my HOUSE now and sleep in a BED!” Apparently, my partner, Alicia, was woken up by someone who came to our tent late at night, pounding on the side and yelling, “Wake up! Get a job!” I, however, must have slept through that one. People waiting in line for food at the Union Appreciation Celebration Barbecue. The extent of the organization of the Occupy movement was shown to me on Saturday night. Occupy STL sponsored a “Union Appreciation Celebration” barbecue, complete with food, live music, and speakers, including the great-great-great-grandniece of Samuel Gompers, founder of what is now the AFL-CIO. And while a couple of skirmishes emerged in the crowd, for the most part, it was a joyous and informational celebration. The event was free to the public, and while there were still protesters holding signs on the sidewalk, anyone that stopped and talked was invited to come down into the plaza to celebrate with us. The event began at 5:00 PM, and was still going when Alicia and I had to leave St. Louis around 9:30. If you know nothing about the Occupy Wall Street movement, or if you only know what is covered by media outlets, you may be inclined to believe that the Occupy movement is nothing but a bunch of angry liberals too lazy to get jobs, so they’re taking to the streets to get the government to give them benefits they don’t deserve. 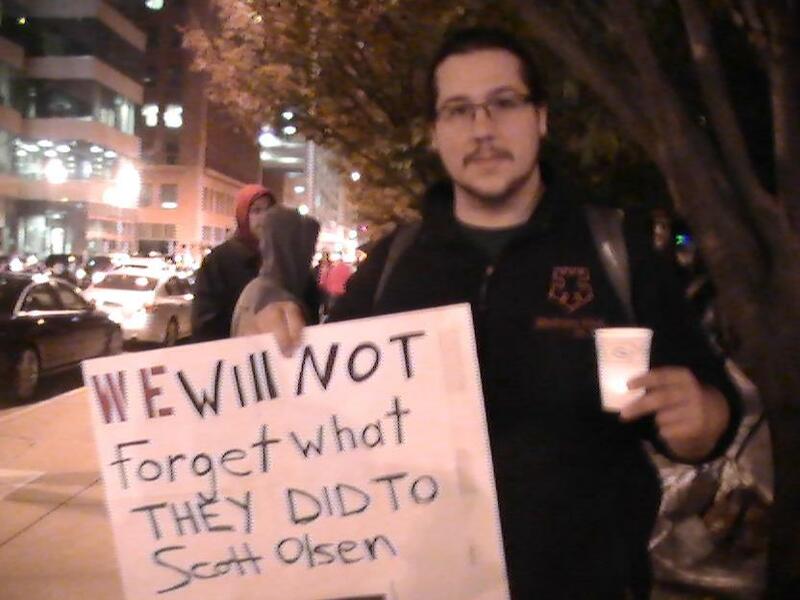 Personally, I knew virtually nothing about the Occupy movement before volunteering to go to Occupy St. Louis. I had only been reading up on the movement for a couple of weeks, really getting in-depth in my involvement since I heard news of Scott Olsen, an Iraq war veteran who was hit in the head with a tear gas canister during the Occupy Oakland protests. Arriving at the camp site around 7:30 PM on Friday, October 28, I could immediately tell I was in for a treat. 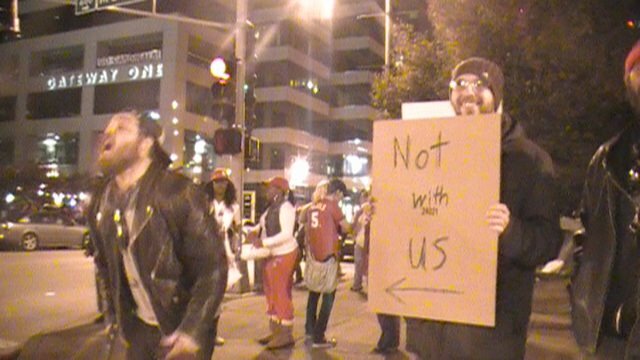 Protesters were already standing on the street corner, holding signs and chanting slogans, as Cardinals fans walked by, a lot of them drunk, worried more about the results of World Series Game Seven than what protesters on a street corner wanted to say. A freelance computer programmer, formerly making over $120,000 a year with Microsoft before his position was outsourced. A T-Mobile wholesaler, in charge of six T-Mobile franchises in the St. Louis area, who was forced to declare bankruptcy and move to a small apartment with his wife and kid. Full-time college students who would prefer not to graduate deep in debt. A postal worker from the St. Louis area. A stay-at-home mom who comes out during the day while her kids are in school. In talking with these people, they did not appear to be “angry liberals” or free-loaders; they were just hard-working people who come out to support a cause they believe in whenever they get the chance. In fact, if anyone could be personified as “angry,” it was the people that drove or walked by and hurled insults at the protesters. Among the many passing calls to “get a job” and “go home,” some people stopped to confront the protesters face-to-face. But despite the cause, it’s important to note that the Occupiers are human, too. When the Cardinals won the World Series, and crowds of people ran into the streets, all of the Occupiers set down their signs and celebrated with the people. For a few moments, there was no 99% v. 1%. Instead, there was 100%, a huge crowd of people proud of their hometown team, and wishing to express that joy however they could. Even amongst the verbal abuse and insults, there were some magical moments. Some people genuinely wanted to know about the cause, and would stop and have very civil and productive discussions. Some people knew what the cause was, but wanted to know what ideas we had in going about change. There were a few people who even had a change in heart after talking with us. One lady stopped to tell three of us to get off our asses and get a job. “I have a job,” said two of them. In lieu of everything that happened during that day and into that night, those words of half-support were very meaningful. She may not fully understand what the Occupy movement is about, but a seed was planted. Hopefully, in time, the movement will have her full support.